My M-16 and our FDC M-79 grenade launcher just after a daily cleaning. Dirt caused many malfunctions so we cleaned our small arms daily and applied LSA lubricant. So much dust settled during the dry season that we cleaned them several times a day. Artillerymen seldom used small arms when operating inside firebases, but we needed them to work dependably when in a fight. During an attack on a firebase 105mm howitzers trump small arms for fighting back; most times. The M-79 fired a stubby shell with an explosive charge similar to a hand grenade. A skilled operator could shoot hundreds of yards accurately. These and shotguns had romantic appeal but were ineffective in most conditions. A well-oiled M-16 delivered deadly 5.56mm bullets accurately and rapidly. 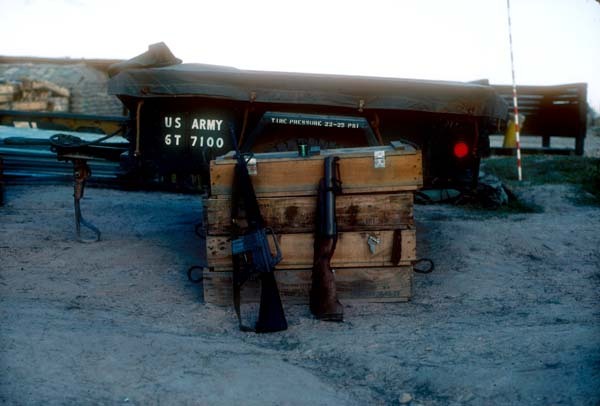 Reloading time was a weakness when using an M-79 or shotgun.